Rare Robert Frost Collection Surfaces 50 Years After His Death Jonathan Reichert, professor emeritus at the State University of New York at Buffalo, has donated a rare collection of Robert Frost's letters, photographs and audio files to the school. The materials chronicle the decades-long friendship between the poet and Reichert's father, rabbi and poet Victor Reichert. 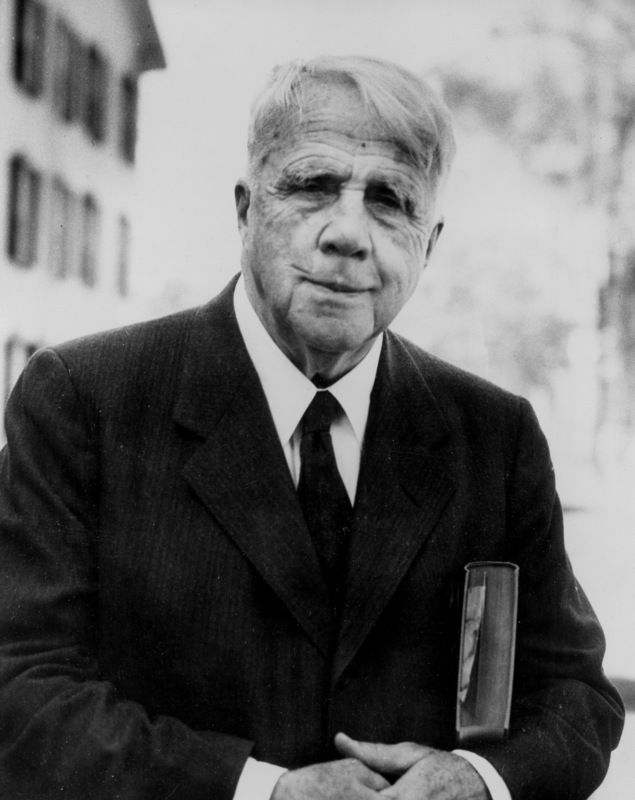 American poet Robert Frost, shown here in 1955, died on Jan. 29, 1963. Now, 50 years after his death, a rare collection of letters, audio and photographs sheds new light on his religious beliefs. Tuesday marks the 50th anniversary of the death of the poet Robert Frost, famous for such poems as "Stopping by Woods on a Snowy Evening" and "The Road Not Taken." Fans of Frost's works have another reason to pay special attention to his legacy this week: Jonathan Reichert, professor emeritus at the State University of New York at Buffalo, has just donated a rare collection of Frost materials to the university. Frost was a family friend of the Reicherts, and though Jonathan Reichert was nearly 60 years younger than the iconic poet, he nevertheless had a meaningful friendship with him. "I wasn't afraid to talk to him, and he, I think, was very willing to engage with me," Reichert says. "I was very lucky in that way." "He was always wrestling with big ideas ... and what was interesting is later on you discovered that that talk appeared in poems," Reichert remembers. "Conversations in our schoolhouse in Vermont, long evenings of conversation ... and then later, a new poem would be published, and there would be lines you'd swear you'd heard before." One of the "big ideas" that preoccupied Frost was religion, and many Frost scholars have puzzled over the poet's religious views. Reichert says Frost summarized his faith by calling himself an "Old Testament Christian." "He saw that the laws that Judaism had built up really were not the essence, and that Jesus was a great prophet, rather than seeing Jesus as the son of God, or the savior," Reichert said. "That's how I interpret what he meant when he said, 'I'm an Old Testament Christian.'" Frost's personal religious views remain mysterious to this day, but according to Reichert, that's the way the poet would have wanted it: "Frost liked to play with you. He liked to leave mysteries. He did not like to spell — I mean, that's what a poet is — a poet doesn't lay out ... a poet gives you a metaphor and lets you wrestle with it." An exhibit featuring letters, photographs, recordings and other materials from the collection will be open to the public at the State University of New York at Buffalo for two months, beginning Jan. 31.